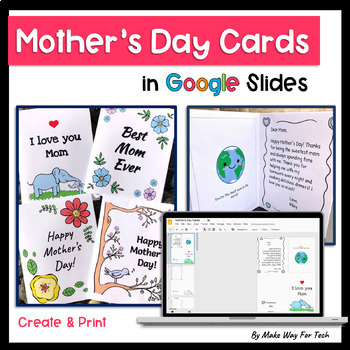 Have your students create their Mother's Day cards in Google Slides this year and avoid all the shopping for supplies and mess! Your students will choose their favorite design from 5 card templates in Google Slides. Then they'll customize their card by adding text and images to make it special for their mom. Text boxes and labels are included in each section of the card so students know exactly where their text and images should go while they create it. When they're finished, print the cards in color, on bright paper, or in black and white for your students to color in. Each card takes only 1 piece of paper to print and fold and the best part is, there's NO PREP for the teacher! Don't want a typed message inside the card? 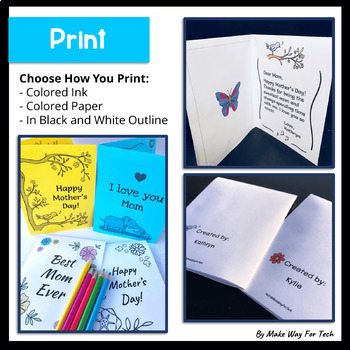 Leave the message box blank, print, and let students hand-write their personal message to their mom. 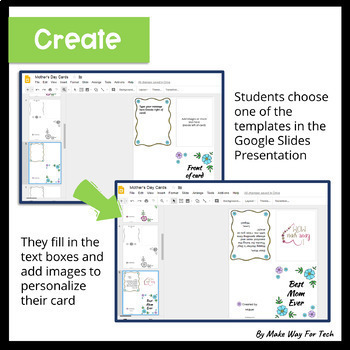 ★ A 10-page teacher's guide for sharing the presentations with or without Google Classroom, directions for completing cards, inserting pictures, adding fonts, printing, and more. Click the PREVIEW to see the product in action (make sure to enlarge it while you watch). If have you any questions, please don't hesitate to ask me through the Q&A section. ♥ Click here to get notified when we add new digital resources. ♥ Don't forget you can earn TpT credits by leaving a review after you purchase products.